It can be very interesting to see grand jurisdictions extend themselves overseas. Their are challenges on the one hand, and benefits on the other. I think few American grand jurisdictions have extended their territory overseas as much as the MW Prince Hall Grand Lodge of Washington,F&A.M. Their list of countries is quite impressive. There are interesting examples -- the Grand Lodge of Massachusetts lodges in Central and Latin America, the United Grand Lodge of England in the American Virgin Islands, of course the Irish,Scottish and English lodges remaining as a legacy in Australia, India, and elsewhere. The Shrine in Washington DC has been busy planting overseas. The Grand Lodge of the F & AM of Lebanon was formed by 3 Lodges who worked under the District Grand Lodge of Syria-Lebanon under the Grand Lodge of New York. The District Grand Lodge with its 9 remaining Lodges, still functions under the Grand Lodge of New York. The issue with Scotland is not teritotial. 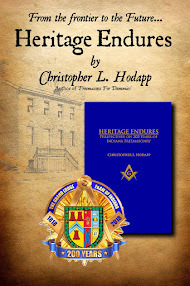 Scotland, knowingly and intentionaly, took in Expelled New York Masons in direct violation of Common Masonic Principles. Thanks for this information. I have read this elsewhere as well and have updated the story. As for the Scotland business, I linked to the actual story from last year instead of trying to re-explain it here. However, I have added a slight qualifier. A slight correction, Grand Lodge of Scotland has 10 active Lodges working in Lebanon forming the District Grand Lodge of Lebanon, and are consisered the Senior Lodges in the region. 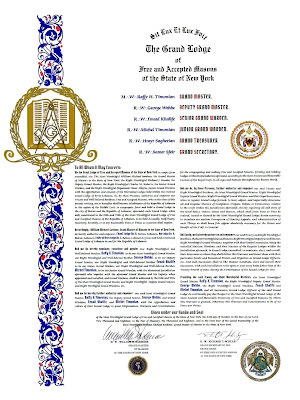 As for the conflict between them and Newyork, the info provided here is in acurate, knowingly and intentionally are not proffessional words, i advise you to read the History of the Grand Lodge of Scotland my dear brother. the Grand Lodge Of Lebanon was formed on the 24th by 3 lodges, one of these lodges was dormant for the past decade, in addition the officers and members of the other 2 lodges were not aware of any of this, and now when it became public they are against, the WMs of these 2 lodges seemed to act without the consent of their lodges' members. it you can ask MW Sardone his opinion about that!! 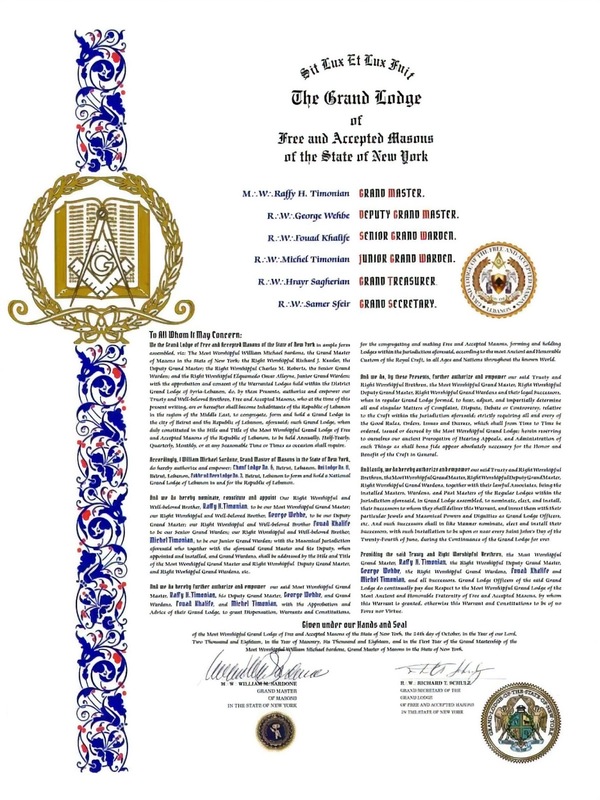 The purpose of establishing a Grand Lodge in Lebanon , is simply to protect the District Grand lodge of New York . 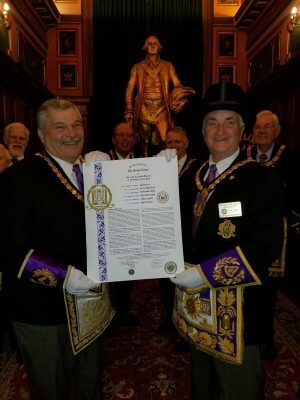 New York grand Lodge has no intention to close their District in Lebanon but on the contrary it will use that New established Grand Lodge as a legal and international support . This message was diffused by the District Grand Master RW Tarek Issa. 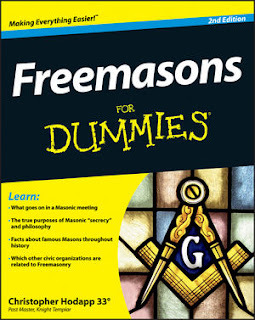 WMs acted without the consent of their past masters, brethren and trustee. The formation of a Grand Lodge in Lebanon was never discussed, needless to say voted for, within a lodge or among brethren. It was imposed!!! 1- Fakheruddine Lodge (no. 1903) and Ani Lodge (no. 1911) are now suffering internal problems between their WMs ( The Grand Secretary and Grand Treasurer of Grand Lodge of Lebanon) and the members of these Lodges due to the monolithic decision they both took by signing the petition without the consent of their Lodge's members. 2- The third Lodge to sign the petition was Chouf Lodge (no. 1904 or no. 1906) excuse my inconvenience since this Lodge has been dormant for over than 10 years. The Lodges of the District were SHOCKED by members of the old-new Chouf Lodge which was restored back to light on the 24th of October 2018 just to sign the petition of the Grand Lodge Of Lebanon. I've been more than lenient and patient here, but I won't publish any more Anonymous messages on this topic. You've had your say, but you cannot make accusations and not make yourself known so that others may answer your comments and know to whom they are speaking.